LX trim, Bright Silver exterior and Gray interior. EPA 26 MPG Hwy/20 MPG City! Heated Seats, Satellite Radio, Bluetooth, CD Player, LX CONVENIENCE PACKAGE (5 SEAT), BLACK CROSS BARS, Alloy Wheels, PREMIUM PACKAGE. SEE MORE! Satellite Radio, Bluetooth, CD Player, Aluminum Wheels. Privacy Glass, Steering Wheel Controls, Child Safety Locks, Heated Mirrors, Electronic Stability Control. PREMIUM PACKAGE interior accent illumination, meter cluster w/7" TFT LCD display panel and exterior pocket lighting, Electrochromic Mirror w/Homelink, 8-Way Power Driver Seat w/Lumbar Support, Push Button Start w/Smart Key, Dual Zone Automatic Temperature Control, Rear Spoiler, LX CONVENIENCE PACKAGE (5 SEAT) Auto Dimming Rear View Mirror w/Compass, UVO Audio w/eServices & Backup Camera Display, Roof Rails, Carpet Floor Mats (5 Seat), Fog Lamps, Backup Warning System, Leather Wrapped Steering Wheel & Gear Shift Knob, Heated Front Seats, 2nd Row Sunscreen, BLACK CROSS BARS Black-non-panoramic roof. Kia LX with Bright Silver exterior and Gray interior features a 4 Cylinder Engine with 191 HP at 6300 RPM*. newCarTestDrive.com's review says "The Kia Sorento is substantially bigger than the Honda CR-V, Ford Escape, Mazda CX-5, and Toyota RAV4. 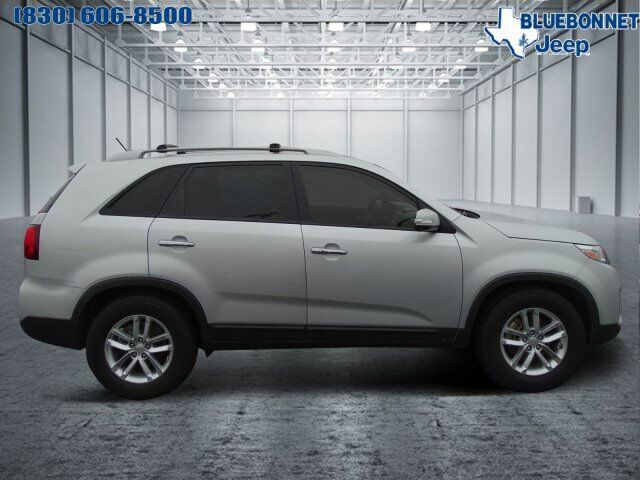 Sorento's larger size pays roominess dividends.". Great Gas Mileage: 26 MPG Hwy.